Graded MINT+ 9.5 by SGC. 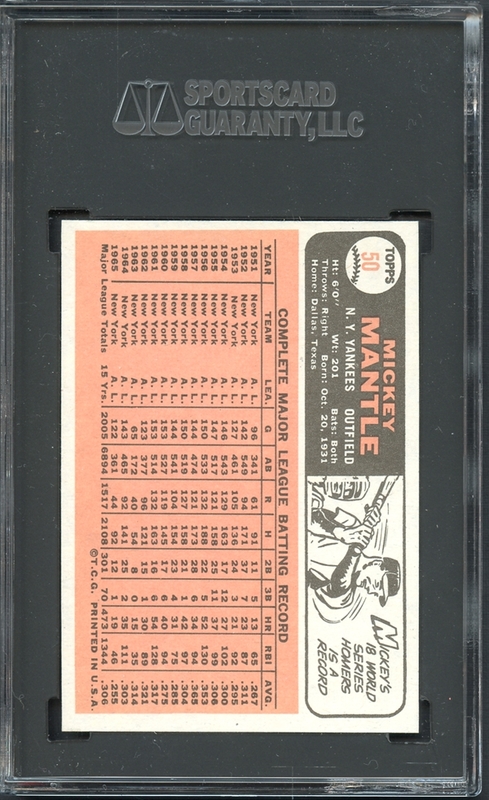 Of the 8548 combined copies of this card that have been graded by both SGC as well as PSA. The total population that has been graded above MINT 9 has been 1 copy, until now! This behemoth was just recently graded at the 39th National Sports Collectors Convention in Cleveland, OH. and attained an astonishing and remarkable grade of 9.5 MINT + utilizing SGC's new grading scale. "The imprint of baseball greatness is upon Mickey Mantle just as surely as the portrait of Thomas Jefferson graces the current three-cent stamp, but it may still take a while before the American sporting public becomes aware of the magnitude of Mickey's talents." --Harold Rosenthal, quoted in the Sport. By the time he was 15, Mickey Mantle was playing semipro ball with the Baxter Springs Whiz Kids, a local team of miners, former high-school stars, and even a former minor leaguer once in a while. One day late in that 1948 season, a New York Yankees scout named Tom Greenwade came to Baxter Springs to evaluate one of Mantle’s teammates, a third baseman named Billy Johnson. But his focus quickly turned to the 16-year-old shortstop, who hit two long home runs, one right-handed and one left-handed. Both landed in a creek well beyond the outfield fence. After the game, Greenwood approached Mantle and asked: “How would you like to play for the Yankees?”4 Mickey and his father were both stunned at first, but soon became excited about the prospect of Mickey becoming a Yankee. Greenwade explained that because Mickey was only 16 years old, he would have to wait until he graduated from high school before the Yankees could sign him. Sure enough, when Mantle graduated the next spring, Greenwade offered him a contract to play for the Yankees’ Class D minor-league team in Independence, Kansas. He received a $1,100 signing bonus and a salary of $400 for the rest of the season. In 1949 he hit an impressive .315 for the Independence Yankees in the Kansas-Oklahoma-Missouri League. When the season ended Mantle returned home to Commerce to work with his father in the zinc and lead mines. Mantle got his first taste of major-league life when the Yankees called him up on September 17, 1950. Although he rode the bench for the remaining few days of the season, the 18-year-old nevertheless traveled and took batting practice with the team. He observed the likes of Joe DiMaggio, Yogi Berra, and Phil Rizzuto as they were locked in a pennant race with the Detroit Tigers and Boston Red Sox. 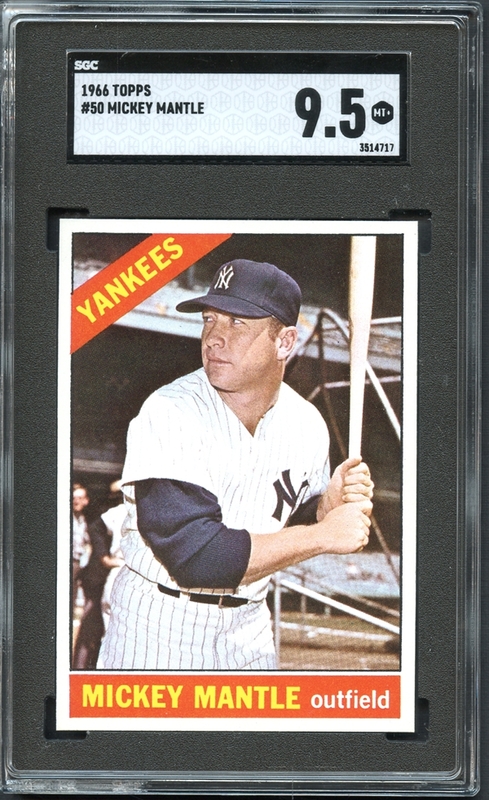 When Mantle arrived at spring training in 1951, clubhouse manager Pete Sheehy gave him uniform number 6, the implication being that Mantle was expected to be the next great Yankee, and therefore should succeed Ruth (uniform number 3), Gehrig (4), and DiMaggio (5). “The law of mathematical progression,” Yankees public relations director Red Patterson later called it. 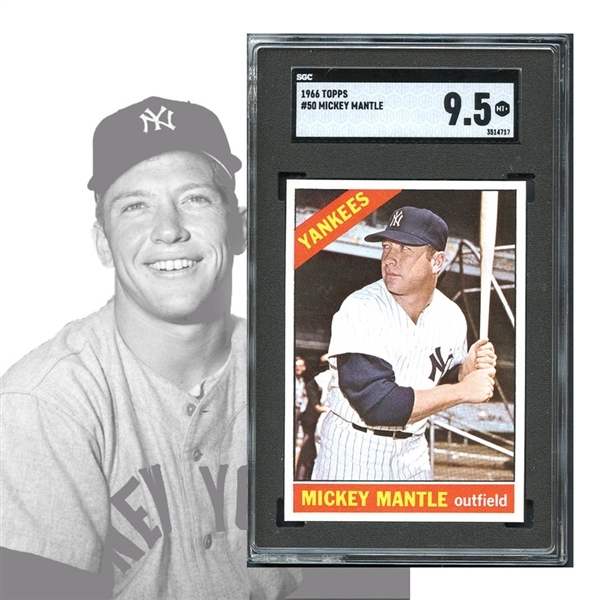 Mantle never liked the number or the expectations it raised. Joe DiMaggio increased the heat when he announced on March 1 that 1951 would be his final season. The next day, manager Casey Stengel announced that Mantle would be the Yankee Clipper’s successor. Despite the heavy expectations suddenly thrust upon him, Mantle flourished in spring training, hitting prodigious home runs in batting practice and leaving teammates in the dust during running drills. 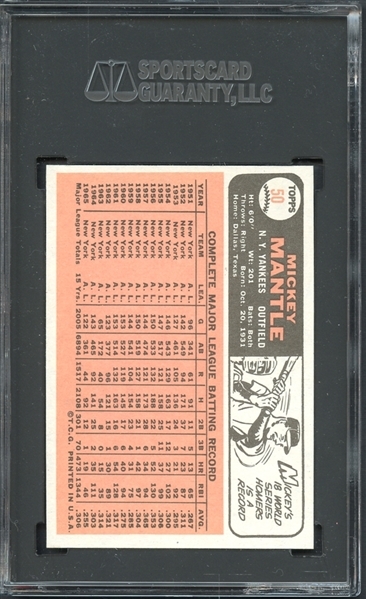 The featured card offers a stunning and altogether fantastic appearance of Mantle in the later stages of his historic career. Adorned in the famed Yankee pinstripes the youthful exuberance has somewhat left the face of the great slugger who is pictured in his powerful left-handed batting stance. Precisely centered with four powerfully MINT or better corners that contour the imagination and appear GEM MINT. The surface is awash in a scintillating presentation that appears mirror-like with no thought of disturbance. The colors elevate the offered keepsake from the norm to the sublime with an execution a breathtaking kaleidoscope that rarely is encountered on a sportscard. The reverse is a stunning well printed palate that presents at the top end of the expectation. In conclusion, the single finest copy of this card we have ever offered and one that comes with our utmost of recommendations.